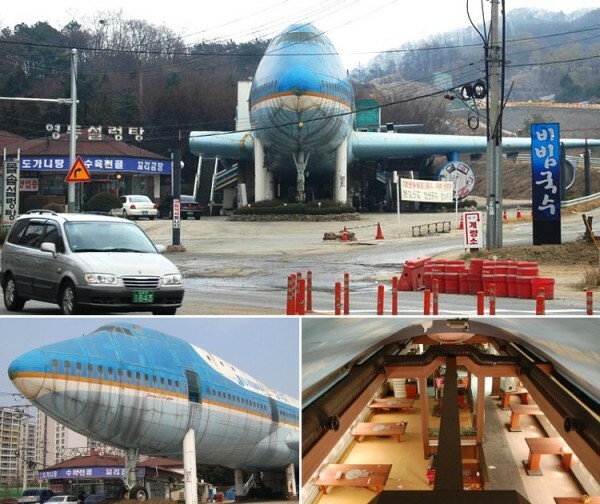 At Mokpo City, South Korea you will find the world’s first Boeing 747 (numbered N747-10) converted to a restaurant. The engine has been converted to a sign board which shows the day’s menu so you can decide on what to eat while climbing up to the passenger section which is the restaurant. Considering the 747’s sheer size the fuselage can easily accommodate 150+ tables. In 2009. it was closed down. So, at the end of the day, the food wasn’t any better when she was flying. Boeing has to figure something to do with their airframes since Airbus is cleaning their clock in the sales/service department. By the time the 787 gets out it will make a great artificial reef of the Washington coast. Don’t do this to an airplane! But why I think this 747’s livery looks like Air Force One? Sorry, not the world’s first 747; that honor belongs to the Boeing 747 at Seattle’s Boeing Field, the Museum of Flight. Same paint and everything. The plane is serialed 001 and is a 747-121. Information per Seattle Museum of Flight. The 747 pictured here is the first 747 to enter commercial service.